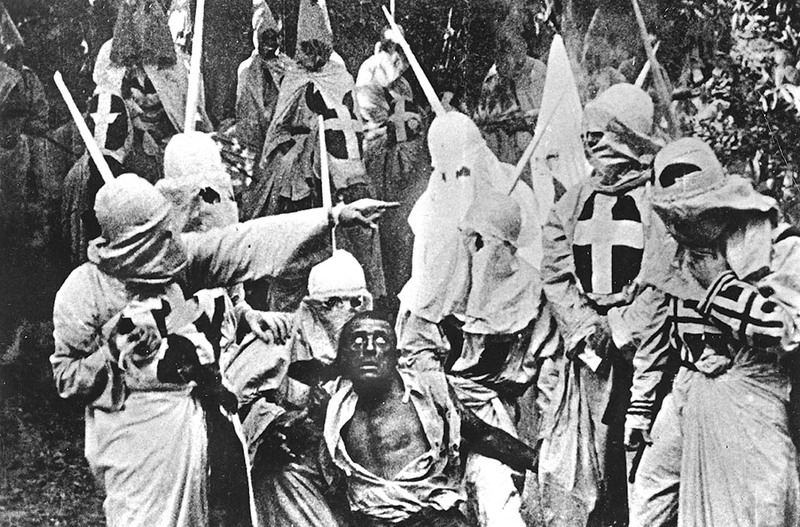 Set in South Carolina and released 100 years ago, D.W. Griffith’s “Birth of a Nation” glorified the Ku Klux Klan as defenders of white Southerners against a black population that was deemed to be unfit for citizenship in the United States. 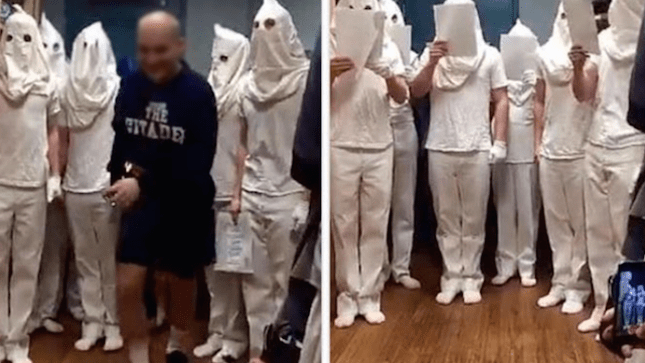 Last week a photograph taken at The Citadel in Charleston, South Carolina showed cadets dressed in Klan hoods, who were reportedly singing Christmas Carols. Of all the places for this to happen, especially after the racial violence perpetrated by an individual who identified closely with another symbol of this nation’s racist past. Most, if not all the Democratic candidates have called for the removal of a Confederate Navy flag from The Citadel’s Summerall Chapel. I would be happy if the school’s instructors spent a bit more time on Reconstruction. Have you ever read Pat Conroy’s novel The Lord’s of Discipline? It’s about the Citadel, thinly disguised by another name, in 1966-67. I teach it in my freshman seminar, and I was bombarded with these pictures by former students who remembered the book. It was appalling to see this happening there, but not surprising. I’ve seen it referenced a couple of times since this story appeared. I have not read it. I read The Lords of Discipline in high school — a military school, in fact — and the following semester there was a hot rumor around campus that the school was in negotiations to have the movie made there. (My school, FWIW, looked nothing like the Citadel.) I remember thinking at the time, have you people read the damned book? You should want no part of this! Maybe someone in authority did finally read the book, because the production company ended up shooting in the UK. It is not a book, or a film, that reflects well on the institution. I’m sure the people at the Citadel feel a bit lost considering that, much like VMI, their entire cultural identity revolves around the Civil War and, in particular, the school’s prominent role in the Sumter crisis. Too bad; they’ve made their bed — you know, with hospital corners and such — and now they can lie in it. The Citadel’s CIvil War course is still called “Disunion and the War for Southern Independence.” It ends in 1865. There was quite an on-campus brouhaha about it three years ago. I remember that. Sorry to hear that the title of the course hasn’t changed since then. As a graduate and father of two current cadets, I would like to say that these 8 cadets and what and what the picture appears to be does not represent the school or what it stands for. LT Gen Rosa stated as such in his first statement, “These images are not consistent with our core values of honor, duty and respect” (http://www.citadel.edu/root/statement-2015) and further backed by the Board of Visitors (the governing board of the school). The school has worked extremely fast on this issue – which is a marked departure on how it has in the past. As to the flag, the Board of Visitors voted to ask for relief from the state Heritage Act, which would allow the school to take the flag down. Doing so without relief would be against the law. Unfortunately prior to this incident, the leaders of the SC Legislature had notified the school that they would not be taking the issue up again. Currently an American Legion post is suing the State over the Heritage Act because it prevents them from fixing a WWII memorial that currently segregates the veterans – the Post wants to put them all together. It is my hope that the Act will be stricken down at that point. Andy – while the school celebrates it’s role in the “late unpleasantness” in many ways, it is not the only piece of our identity. Last year on the 150th anniversary of the Battle of Tulifinny – a battle where the entire Corps of Cadets joined some 600 confederates to defend a railline from a far superior Union force and kept them at bay for three days – barely got a notice from the school. Walking around campus, there are memorials from throughout its history. A few of my favorites include the Avenue of Remembrance which honors the alumni dead of WWI and which knobs are required to walk in the gutter, the Major Thomas Dry Howie Carillon Bell Tower (https://en.wikipedia.org/wiki/Thomas_D._Howie) and the plaque on the front of Summerall Chapel that honors all alumni who have fallen while in service to their country. While when I was a student – American History was taught as a Freshman Course, it has since been replaced by Western Civ for most majors. Some majors still hit American History but it is much later now. Reconstruction is heavily touched on in an elective for History majors their Junior year. Reconstruction, Western Expansion, and the Spanish-American War. I appreciate you taking the time to comment and I certainly agree that the actions of these students ought not to be interpreted as representative of the values of the school. At the same time we ought not to ignore the fact that this is not the first incident of its kind. Kevin – I am sure that if you look in any organization you will find bad apples. The key is to find them and get rid of them. This is not a Citadel issue but a higher education issue. The administration will not tolerate these actions – and when they find out about them – punishment happens. The first incident mentioned in the article linked is from 1986, which may not seem long ago – but it was before I went and graduated, lived a good bit and now have two kids there. To bring it up would be valid if the school had not made serious advances in this area in the past 30 years. This includes a larger percentage amount in the form of diversity than the flagship schools in the state (Clemson and USC). This is not saying that the school cannot improve in areas – but I want to make sure that folks get that the school has and continues to strive towrds this. Finally, Ms Jackson’s statements should be taken with a grain of salt as she claimed a lot of things, many that were proven false. Also, you might consider taking a look at “Marching in Step” by Alexander Macaulay. It takes a good look at what the school had to do, decade by decade, in the 20th century to adjust and survive to the changing social landscape – including integration and what it needed to do on the diversity front. I am sure that if you look in any organization you will find bad apples. I completely agree. That said, I hope the school will follow up with something constructive given the time and place in which this incident occurred. I’m in total agreement on that Kevin and will be glad to call it out if they don’t. I’m also hoping that it will give the administration cause to be a bit more vocal on the removal of the flag – because right now it just seems like they were told no and stopping. They need to push to get it done sooner than later. Thanks for a thorough and thoughtful reply. I appreciate it.